On Saturday, we celebrate the Feast of the Triumph of the Cross. At first glance, it might be hard to see the cross as a triumph. But, together with our readings from this Sunday, we can see the real triumph: the expansive love of God for his people. But often this love is not fully understood by people. Christ came into the world for our salvation. St. Paul speaks about being the foremost in need of salvation. He tells of the mercy and love that he received. This is the same mercy and love that each of us needs to seek. And it is always mercy for the sake of love. In the Gospel of Luke this Sunday, the Pharisees question Jesus’ interaction with the sinners and tax collectors. In response, Jesus tells a series of parables that tell of rejoicing upon the return of one — one lost sheep, a lost coin, a lost son. Why would we rejoice with the return of one? The rejoicing exhibited in these parables shows the depth of the love that God has for all of his children. The parable of the lost sheep stresses the search for the one sheep that has been led astray and how much rejoicing there will be when the lost sheep, the sinner, returns to the flock. The parable of the lost coin tells of great searching for a single coin. Why would one search for a single coin? What worth would this coin have? The seeking of one sheep and searching for one coin can seem like foolishness, but it shows the extensiveness of God’s love for all. Each person has such great worth to the Father that when he can welcome us into his love, our Father rejoices. 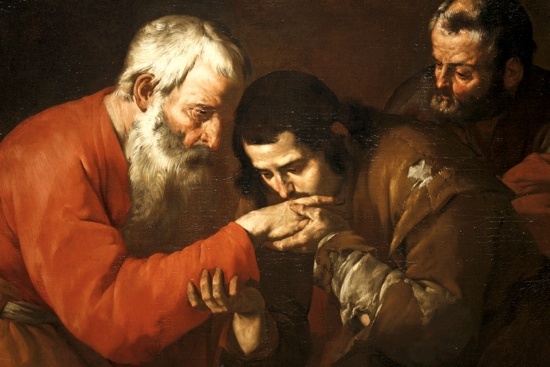 In the final parable of the Gospel, we hear of the prodigal son. The son wanted to live his life on his own terms, but he came to realize that he was foolish. He returned to seek his father’s forgiveness, and the father rejoiced in his return. No matter how lost we are, we will never be rejected by the Father if we seek his forgiveness and mercy. The love that the father gives to the son shows us the depth of the love that God has for each one of us. Deacon Anderson is in formation for the priesthood at the St. Paul Seminary for the Diocese of St. Thomas in the Virgin Islands. His teaching parish is St. Gabriel the Archangel in Hopkins. How have you experienced God’s forgiveness and mercy in your life? Consider receiving the sacrament of reconciliation today.